Meet Ms. Perpetually Outraged. 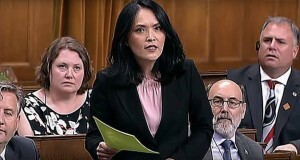 Meet Jenny Kwan. Jenny is the archetypical Social Justice Warrior. A champion of the downtrodden, the marginalized, the excluded, The Other. Her C.V. is impressive. Jenny was born to be the Immigration critic for the New Democratic Party. Especially now, when we all bear witness to an unfolding global migration crisis that threatens to worsen by several degrees of magnitude in the coming decade. This is her time. Jenny’s world is full of victims. She sees victims —and perpetrators—everywhere. And if she can’t meet her quota of victims in Canada, she will look for victims in 194 other countries. And all of them, apparently, have a right to seek refuge in Canada. For Jenny, and all of her parliamentary colleagues, Canada is a land of infinite capacity. It is a big place with lots of room for lots of people. A treasure trove of resources that need only be tapped to fund a social safety net for all of humanity. We can be the soup kitchen of the world. The hospital for all who are sick. An counselling centre for all those who have been traumatized. The words “carrying capacity” are beyond her comprehension. If there is no food in the kitchen, we need only extend the table. In Jenny’s world, there are no limits. No financial limits. No limits to ethnic fragmentation. No limits to the ability of a nation like ours to assimilate or integrate a multitude of ethnicities. No limits to growth in a finite world. The only limits Jenny can imagine are the limits that she wants to set on free expression, on the speech of people who disagree with her vision of utopia. Every dissident view is inherently “hateful”. Even the mildest criticism of diversity or God forbid, immigration and refugee policy, is intolerant and unacceptable. There is no place in Jenny’s world for opinions like that. Jenny never met a refugee claimant—or a potential refugee claimant—that she didn’t like. She can’t conceive of an asylum seeker who doesn’t deserve a hearing. Or whose tale of woe is less than credible. A migrant on the run must always be believed. A CBS agent who pursues him must be inhibited. A city that offers him sanctuary must be praised. In Jenny’s world no one is illegal. Jenny’s victim list is endless. New categories of humanity are added each day, with no end in sight. Nor longer is refugee status to be exclusively conferred on those who fear political, racial or religious persecution or flee from war. The 1951 Refugee Convention is a strait jacket that no longer applies. In Jenny’s world legitimate candidates for refugee status can be anything. They can be battered women, gay men, transgendered people, men nagged by their wives, children with club feet, teenagers with acne, office workers with B.O., southpaws, midgets, the obese, girls who can’t get dates and of course, anyone who lives in Trump’s America, where no one is “safe”. According to Jenny. Jenny’s world is a scary place. But not half as scary as Canada will be if she and her like come to control the government. Think of Justin Trudeau to the tenth degree. Think of Raspail’s “Camp of the Saints”. Think of Orwell’s 1984, or Sweden on steroids and you will get an inkling of the kind of nation Canada would become. Of course, it really wouldn’t be a country because nations imply borders. Strip Jenny’s arguments down to its rudiments and your suspicions are confirmed. Jenny simply does not believe in sovereign nations. She opposes free trade agreements, but she believes in the free movement of people. Migrants have rights. But not the people whom they would displace. Go figure. I don’t want to live in Jenny Kwan’s world. I don’t want refugees to make a refugee out of me. Where do I run? Where do I hide? Where and when do I make a last stand? I am white and there is a bounty on my head. My tribe is on the hit list, slated for cleansing. A disease that must be eradicated. The bane of human existence. A perpetrator who has it coming. At least, that’s what they tell me, in Jenny’s world.